Virgin Atlantic and StudentUniverse have teamed up to provide you the best student discounts on airfare. Study abroad, vacation, backpacking— whatever your reason for travel, Virgin Atlantic and StudentUniverse will get you there in style. 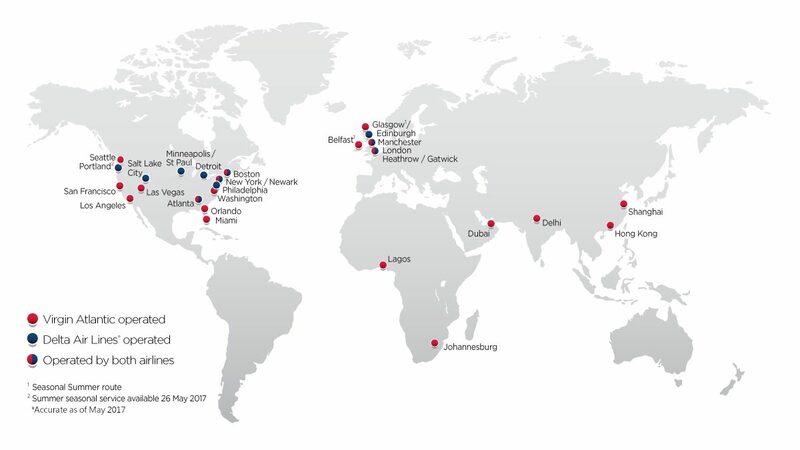 Together, Virgin Atlantic and partner Delta Air Lines have 26 nonstop destinations around the world, and 39 transatlantic flights a day. Virgin Atlantic was recently recognized as one of Conde Nast Traveler Reader’s Choice “Best Airlines in the World,” receiving high marks for all cabins and entertainment onboard. There are a host of little extras for you to look forward to when flying Virgin Atlantic. A choice of 3 complimentary meals, a free amenity kit, and extra legroom options for a more roomy journey. Enjoy award winning blockbuster entertainment on your flight. Listen to music, relax with Headspace meditations, or just relax and watch a movie – so many options to help you enjoy your trip from the moment you step on the plane. Virgin Atlantic is the first European airline to offer fleetwide WiFi, so you can stay connected throughout your journey. Baggage fees and policies differ per ticket type. For more information, be sure to check out their baggage information page.